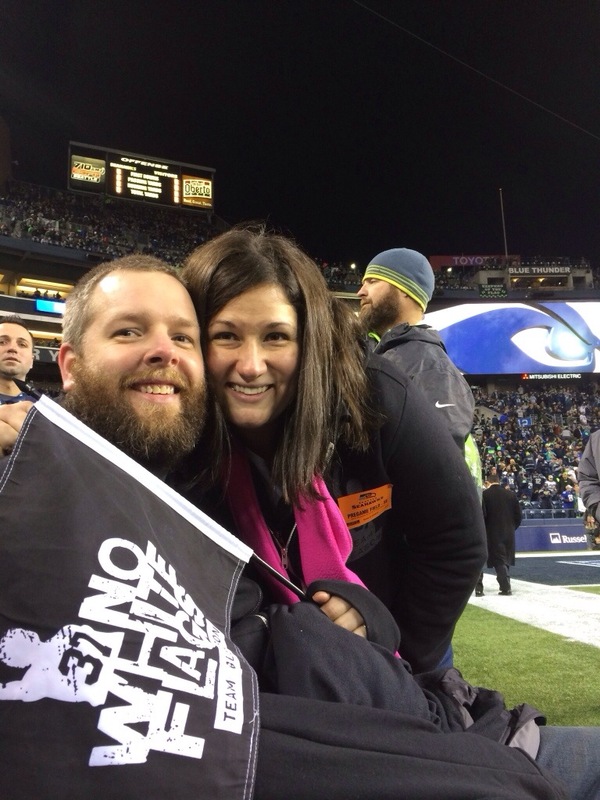 Dave Martin, a TG board member from Spokane, spearheaded a TG adventure for the Saints/Seahawks game at CenturyLink field. 4:30 pm – Pregame Sideline starts – please plan to be dropped off at attached designated area by 4:15. Anne from the ALS Evergreen chapter has been kind enough to coordinate you transportation to and from the game. Thank you Anne! 5:00 – We will go to our seats to enjoy the game. Max Unger and the Seahawks were kind enough to secure Team Gleason our tickets in Section 209 row AA. Thank you Seahawks! I wanted to thank each and everyone of you for making the seahawks game such a memorable day for Jonathan and myself. Your kindness and generousity was emotionally overwhelming to know that so many people care about our family. Just knowing we were going to the game was so exciting but finding out we were going on the field put it over the top. Then, Ray and Dave came over to our house to meet us before the game and gave our girls new dolls and played with them. It put huge smiles on their faces and they asked us if Dave and Ray were their uncles. While at the game, we were treated like celebrities from food being provided to even being able to go to the front row of the game with the Summit Capital Gang. Everything from start to finish was amazing. Thank you so much for giving Jonathan and myself this memory of spending quality time together. The experience was incredible but its even more priceless to meet such incredible and inspirational people. Thanks again and hope to talk again soon. My fiance and I were at the game and met Steve’s mother. Took a photo with her. Any idea where I can find it? Reblogged this on Black Gold & Bold.